One of former Attorney General Loretta Lynch's top lawyers at the Justice Department helped edit Obama administration press statements about the infamous meeting between Lynch and Bill Clinton on a tarmac last summer. The same attorney, Paige Herwig, is now the deputy general counsel for Democrats on the Senate Judiciary Committee. That panel is now investigating whether Lynch played any role in trying to influence the scope or intensity of the FBI's investigation into the Hillary Clinton email scandal. Prior to her legal work with Lynch at Justice, Herwig was a special assistant and associate counsel to President Obama. Newly released Justice Department emails show that Herwig, whose title was counselor to the attorney general at the time, helped edit the first media statement responding to inquiries about the tarmac meeting. Those emails were included in 413 pages of Justice Department documents the American Center for Law and Justice (ACLJ) obtained through a Freedom of Information Act lawsuit. The emails show that on June 29, 2016, two days after the Clinton-Lynch meeting when the national news media was first learning of the tarmac one-on-one, Melanie Newman, the then-director of public affairs at the Justice Department, emailed her FBI counterpart to "flag" the media stories about the tarmac meeting that she noted were "gaining traction tonight." Newman included a transcript of a question Lynch answered about the meeting the following day, as well as Justice Department talking points on the topic, which are redacted in the emails. "Our talkers on this are below, along with the transcript of the Phoenix presser, where she was asked about this," Newman said in the email. "Happy to discuss further by phone. Please let me know if you get any questions about this. Thanks." Just 19 minutes earlier, Newman had emailed the same Lynch transcript to an assistant press secretary at the White House. Additionally, Lynch’s deputy chief of staff contacted Comey's chief of staff and counselor, Jim Rybicki, July 1 but the email string noting that contact is heavily redacted. The tarmac meeting occurred at the end of an FBI investigation into Hillary Clinton's use of private email servers while secretary of state and just as the presidential campaign was intensifying last summer. Before the tarmac meeting, Lynch would have been the official to determine whether to pursue criminal action against Clinton. But after it, she said she would accept the recommendation from the FBI and career prosecutors at the conclusion of their investigation. Just four days later, then-FBI Director James Comey held a press conference to announce the findings that essentially cleared Clinton from a criminal indictment. Comey has said the tarmac meeting was a "deciding factor" that led to his decision to take on the role of announcing his conclusion that Clinton was "extremely careless" but not criminal in her actions. Since then, the New York Times reported that the FBI had obtained an email or memo written by a Democratic operative "who expressed confidence that Ms. Lynch would keep the Clinton investigation from going too far." The authenticity of the document was and remains in doubt, but sources have said it influenced how the Justice Department and FBI interacted in the investigation. Comey also has referred to the document in saying he decided to take on the role of announcing a decision on the Clinton email scandal instead of Lynch because he worried if the memo went public it would raise doubts about the independence of the probe. 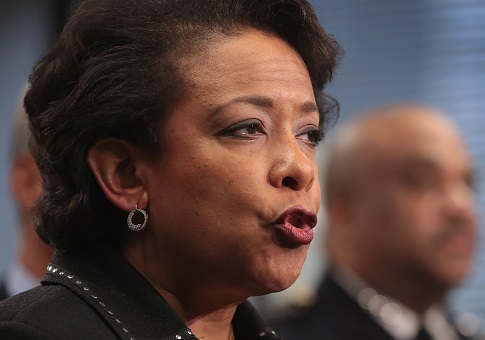 The same batch of emails, released to ACLJ last week, earlier showed that Lynch used the alias "Elizabeth Carlisle" for official emails as attorney general, including those related to the tarmac meeting. The batch also shows the Washington Post and New York Times reporters demonstrating some reluctance to cover the Clinton-Lynch tarmac meeting. The Justice Department talking points and press statements about the tarmac meetings and the edits to them are redacted in the email string the ACLJ obtained through its FOIA lawsuit. In addition to Herwig and Newman, the string includes Kevin Lewis, another press officer; Carolyn Pokorny, the then-deputy chief of staff and counselor to Lynch; Peter Kadzik, the then-assistant attorney general for legislative affairs; Umu Amuluru, another counselor to Lynch; Shirlethia Franklin, deputy chief of staff under Lynch; and Matthew Axelrod, the principal associate deputy attorney general. The email string originates with a query about the tarmac meeting from Fox News's Mike Levine asking for Newman and Lewis in the Justice Department’s press office to address his questions "ASAP" because a Fox News affiliate in Phoenix "is hearing that the AG met with Bill Clinton on a plane last night for close to an hour." Within one minute of receipt of the Levine email with the subject line "Bill Clinton meeting?" Newman looped in Pokorny and Lewis, with a terse directive, "We need to talk. I’m on cell [redacted]." A minute later, Axelrod was added to the chain, saying he was free and would set up a conference call line. This entry was posted in Issues and tagged Clinton Email Scandal, Hillary Clinton, Loretta Lynch, Ready for Hillary. Bookmark the permalink.